Expandable Bangle 18K White Gold Plated Crystal Cubic Zirconia Rhinestone Open Cuff Bracelet For Women Girls 6.5"
Wealthmao is devoted to provide fashion and beautiful decorations and jewelry for women,men, and girls. If you are satisfied with this white gold open cuff bangle and our service,Please kindly leave us a honest feedback. Please freely contact us to get a better solution before you leave a neutral or negative feedback. We will provide you the best service. Advice:All jewelry will fade as time pass,Good maintenance can help to keep longer. 1. 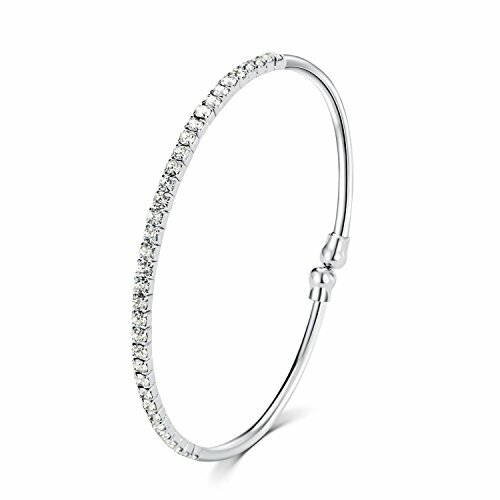 Remove the white gold expandable bangle before sleeping and washing. 2. Avoid wearing your white gold girls bangle in such situations where it may be damaged easily, e.g when doing manual jobs,bath or playing sports. 3. Avoid contact with household chemicals, perfumes and hairsprays and other beauty products. 4. Clean with soft cloth,Place in box or pouch and separate from other items which may knock or scratch it. If you have any questions about this product by Wealthmao, contact us by completing and submitting the form below. If you are looking for a specif part number, please include it with your message.